By using these values in different ways a number of effects can be implemented. Note that the inset shadow requires the word inset to be used as the first value. In your custom CSS add selectors, properties and values. I have called the selectors .shbox- followed by the type of shadow. 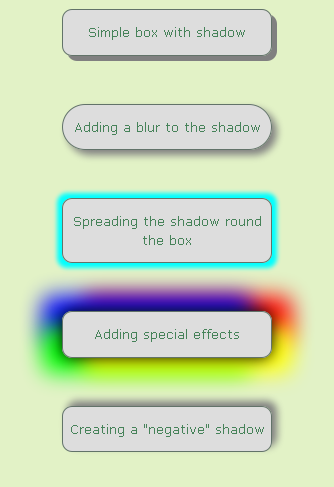 In the example below I have given each box the same basic values and just changed the shadow. It would be possible to specify the box shadow values in your div using style =. This is useful for occasional use or where the box will differ from the default you have set in your CSS. This requires Firefox 3.5+ or Safari 3.0+. These box shadows are a good way of creating interesting-looking buttons, particularly if you combine the box shadow with the rounded corners. RobElliott. Please visit his/her userPage. If you think this solution is useful, please increase the rating. I only see the effects in the photo…. Which version of FF are you running? It needs 3.5 or higher. Sorry, Rob. I thought it updates automatically. It seems that I had 3.0. Now I downloaded 3.5 and I see it. What if I don't want the text to be centered? I removed the "text-align: center;" and it did the trick but now the text starts right from the left border. How could I get a little margin there? I played with "margin:? ?px;", but it moved the whole box instead of the text. Btw, wouldn't "width: auto;" work better than "width: 20%;"? It's not margin you want here, it's padding. So add padding-left:5px and adjust to taste. wouldn't "width: auto;" work better than "width: 20%;"
It depends how wide you want the box. Width:auto will made it as wide as its containing box which I definitely didn't want so the width:20% was deliberate. There's no rule that says you have to use the properties and values I used in the example. Width:auto will made it as wide as its containing box which I definitely didn't want so the width:20% was deliberate. Ok, I got its function wrong then. I thought that it would adjust to the text width.